Beautiful Tasting Room & Wine Bar, with its magnificent view of the vineyards and the back waters of Gangapur Lake, offers to its guest the perfect atmosphere to enjoy our great wines and cheeses. Registration Fee Rs.250/- per head. The vineyard and winery tour, followed by a wine tasting. The tour comprises of a visit around the estate (Vineyards, Amphitheater, Restaurant, and Cellar, around the Bottling Plant etc.) and the tasting includes a selection of 5 premium wines. Transport cost: If you drive down in your own vehicle no cost. If you plan to come with us cost is Rs.750/- per head for Adult. Food cost: would be on actuals. Optional activity: Glider Aircraft (Fly upto 1000 feet with expert; One Pilot plus one passenger) Rs.400/- per flight per person. (Disclaimer would be to be signed if you wish to participate in this activity). 6:30 pm Sharp we start for Mumbai. 10:30 pm Anticipated time to reach back in Mumbai subject to traffic conditions. Open air restaurant with picturesque view of lush vineyards, the rolling Nashik hills and beautiful Gangapur Lake in the background. The décor of the restaurant truly replicates the feel of dining at a rustic Italian villa. You can select the menu of your preference from a variety of authentic Italian cuisine consisting of wood fired pizzas, hand crafted pastas, and delicious desserts. We also offer several soups, salads and appetizers for diners looking for something on the lighter side. Second option of Restaurant - with specialty Indian cuisine. You can select the menu of your preference from a variety of kebabs, curries and briyani's. 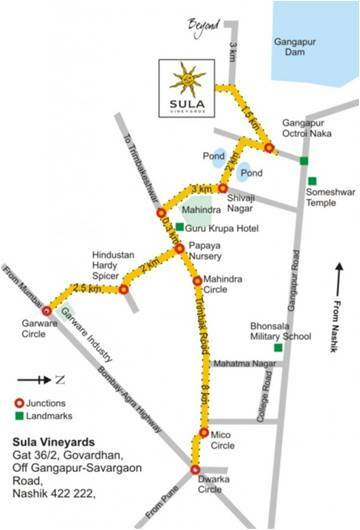 · Follow the road for 3 kms until Shivaji Nagar. · The highway will end at Dwarka Circle in Nashik city. · Turn LEFT at the first junction on Gangapur-Savargaon Road and you will reach Sula in 1.5 kms. · After about 2.5 kms, Turn RIGHT at the first junction on Gangapur-Savargaon Road and you will reach Sula in 1.5 km. 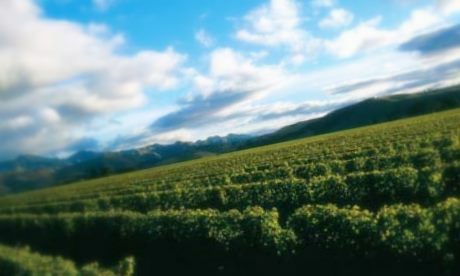 · Drive out the winery road and turn left at the end of the road. · Drive down straight and you will cross Savargaon Village on your left and York winery on your right. 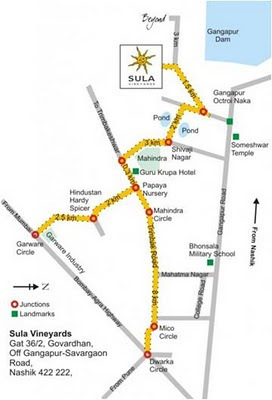 · About 3 kms from the Sula winery you will be able to see Beyond Vineyard Resort on your left.